Pinatas is inspired on the poke ball or monster ball of Pokémon go game. 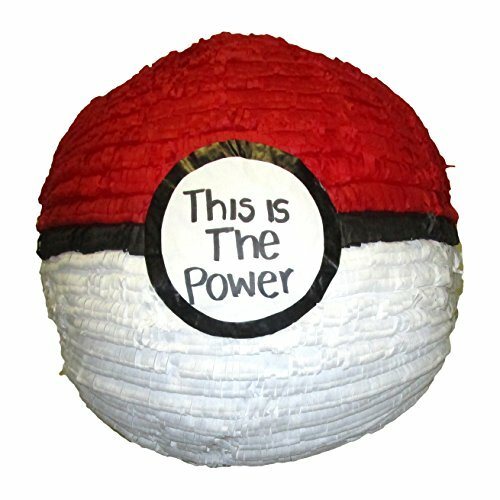 Pinatas measures 13″ high x 13″ long x 13″ deep and holds 3 lbs. Of fillers (sold separately). Features handcrafted 3d paper-Mache molded piñata dressed in fringed cut tissue paper and cutouts. Makes a great hanging decoration, table centerpiece, party game and photo prop for video game themed parties or birthday parties on the Pokémon theme. Comes with strong cable tie to hang piñata. Attach a rope to Pinatas cable tie and hang from a tree branch. Pull the other side of the rope so the Pinatas swings up and down. Guests must take turns to beat it with a stick. Add a blindfold and spin player around for extra fun .